Gorenje is coming back to the IFA fair in Berlin, one of the world's largest consumer electronics and home appliance fairs. This year, three novelties will be premiered that pave the way to new dimensions. Direction: "Beyond White". Each of the new collections has its unique way of addressing the customers. 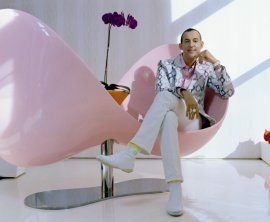 The Gorenje designed by Karim Rashid, a collection that is still cloaked with a veil of secrecy and anticipation, will touch the visitors with the magic of light and the charisma of its designer; Gorenje Retro Collection will glow in the rainbow of new colours; and the new Gorenje Simplicity line will impress with its rational perfection and straightforward operation. Nevertheless, all three collections share two traits: they are power efficient and environment-friendly. Last year, the prototype of the Gorenje for iPod refrigerator seemed to be the one Gorenje innovation that the visitors found the most impressive. As a response to the immense interest in this appliance, the interactive refrigerator is already in serial production this year and it is ready to be displayed in its final version. Integration of modern information technology into household appliances takes their performance to a new level, while keeping the operation simple, interactive and fun; and this is the key message Gorenje is communicating with this year's novelties. One of the projects also includes cooperation with Microsoft.